Commentary: This Super Battle Droid is a redeco with some history. 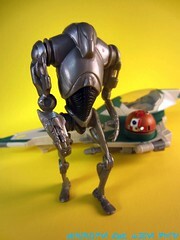 The mold originally was part of a Deluxe Yoda figure set from 2002, in which this figure had a red blast effect, and a later release had a swappable arm cannon. This one just has a removable arm and no real accessories to speak of, as the figure serves as a sort of filler. Hasbro's plan for the 2013 mini-vehicles was to combine the mini-rig vehicle concept with Battle Packs for a $20 price point. In other words, Hasbro's mad scientists stayed up all night to synthesize the perfect birthday party present... and I think they nailed it. This particular oddly-posed Super Battle Droid has only 4 joints, plus his right arm is fully removable. Getting him to stand without assistance is indeed possible, but it is likely that, over time, he'll need some support. Several releases of this mold exist, but this is the only one that's grey. Another was baby blue, and others are basically the metallic blue seen in the movies. Because it's a different color, and looks good, and is part of a good set, I'd say go ahead and buy it. The color looks good, and it's different enough to be interesting... albeit tough to troop-build, if you're fond of it. I love this vehicle to death, as goofy as the idea of Yoda needing an attack fighter may be. The play concept is solid - you get Yoda, something for Yoda to fly in, and someone for Yoda to shoot all in one gift set. It's always a little bizarre to view a figure as little more than a victim for another character, but it is what it is. And it is pretty good. Collector's Notes: The "Yoda Line" has been scaled way back in the USA, and a few items are appearing to be overseas-exclusives. (Meaning I'm in trouble.) Oddly, a brand-new Super Battle Droid mold (the first since 2008) will be introduced later this year in "Saga Legends," and it should have articulation similar to this release with a far, far less action-oriented pose. This wave may be one of the last batches of mini-rig-style vehicles you see for a while, unless Hasbro has a surprise in store, so I'd say go out and get one. Or order online at the Amazon link above or the Entertainment Earth link below. (Heck, after you click it, order anything. I get a small cut.) Thank you for your support!